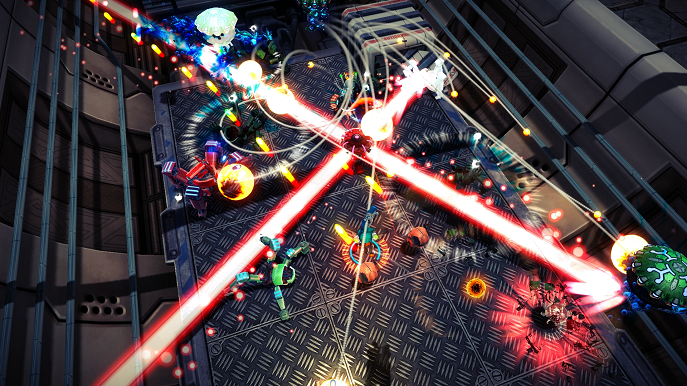 From Indie developer Witch Beam, they raise from the depths of Early Access a fully packed action bullet hell. 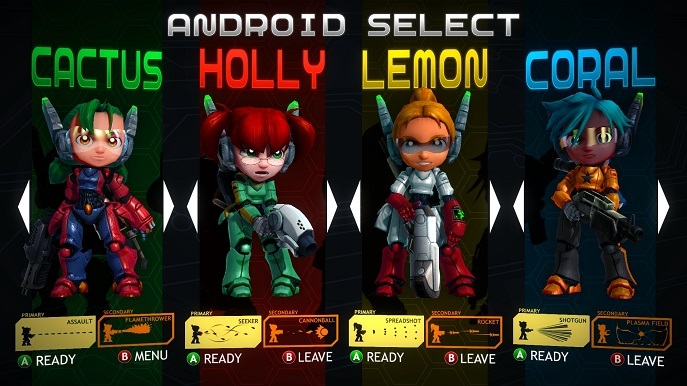 Their latest launched title, Assault Android Cactus is here! UPDATE: PS4 Release Impressions "This game is now more bananas than before." The comedy factor in the game has such an interesting charm, it's right to the point and every character adds their tiny bit to the story. Cactus is obviously the funniest and the cutscenes in the game are quite a shinning element of the whole game. As for gameplay, I can easily say it's pretty much the same experience as the PC version; the game is just very good overall. Of course having it on a current gen console gives Witch Beam quite a push to share this fantastic bullet hell game to as much people as possible, and at a very accessible price. Speaking of accessibility, I believe its something I have not yet mentioned. This game's attention to detail and accessibility options allow to expand their playerbase as well as respect them. These options are something most developers should probably pay more attention to, since gamers are also end-users. If you haven't tried this game out, I would honestly recommend any of it's versions, either PC or PS4, it's all a matter of preference (unless you prefer the other platforms). The amazing experience is the same, and always is a blast of fun. Do find more players to play with, THAT'S when the genre truly kicks in. It’s been quite a run. Having the opportunity to try this game when it joined Steam’s Early Access program was a thrilling experience, from where I thought “how can they further polish this?”. Of course, many issues here and there were encountered, but they were gradually getting squashed. 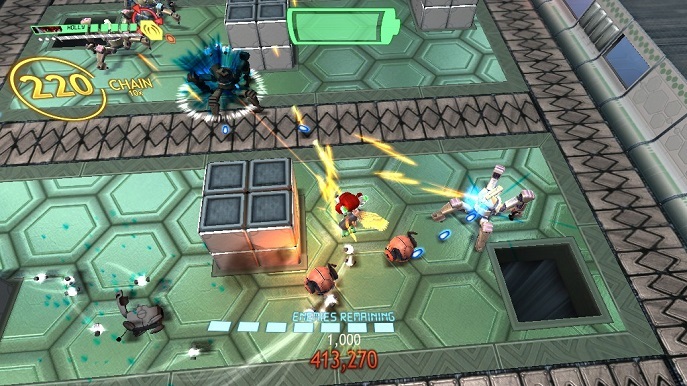 Many of the features promised by the devs have even been enhanced; good example for this are the number of playable characters. Any who, let’s get on to the review. Calm down. Yes, they are androids who are not exactly cactuses, (Cactus is the name of the main character) but they do pack a punch when it comes to fighting enemy robot hordes. The plot can’t really be mentioned without spoiling it; however I will say that it’s basically a rush to fighting a bunch of enemies and eventually entering the boss level. Each boss seems to be commanded by something… Or someone… It’s your duty (and your friends!) to find out the source of this evil and bring a halt to it. 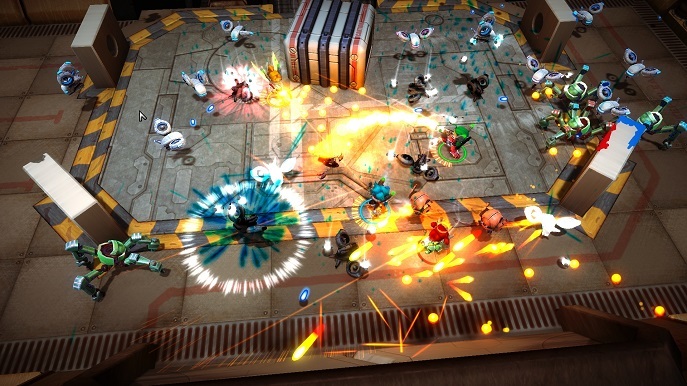 The gameplay that Assault Android Cactus offers is a twin-stick shooter; each character offers a unique primary weapon type that can be infinitely spammed, and a secondary weapon type with has an increased cooldown and higher base damage. 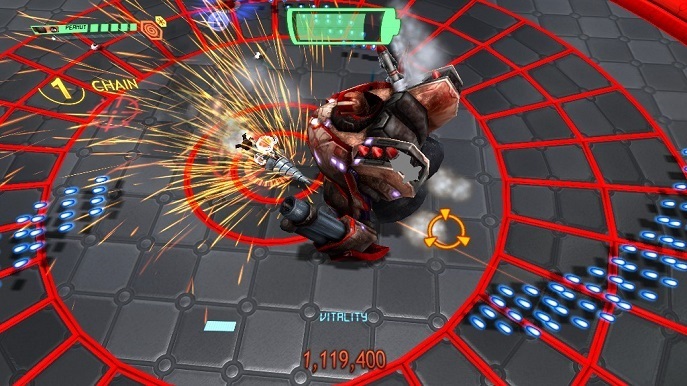 During your encounters with enemies, you will notice you’re facing a bunch of them… and I mean A BUNCH, and even if you have “infinite” ammo, your synthetic heroine runs on a battery. The battery gradually depletes while you kite and destroy your enemies, fortunately a new one drops from a specific mob after each mini wave (or at least that’s my impression). a. Yellow wings: Increases your movement speed to almost cheat code levels. b. Red drones: Companion drones that constantly fire whatever is at the direction you’re pointing at. c. Blue shutdown: Shutdown every enemy on the battlefield briefly for you to shoot them without having to worry of getting hit. These are your helpful power-ups. As I mentioned before, if you don’t pick one up immediately it will shift into another colored power-up, so choose wisely! Just do keep in mind that the battery orb must be picked up as soon as possible as it may disappear. Your playable characters also have a life bar; when strucked by a foe it may replenish fully if you don’t get hit again for a while, but some enemies can really pack a punch or nuke you instantly while your battery is still slowly draining. It all comes down to a DPS race so see which side overcomes the other. If you think fighting hundreds of enemies is a bit unfair, each enemy drops little white sparks that gradually make your primary weapon stronger and more aggressive, with the music scaling the higher the combo by its inevitable hype! SOUNDS GREAT! BUT WHAT ELSE? You don’t have to shout. The game offers unlockable game changing aspects. 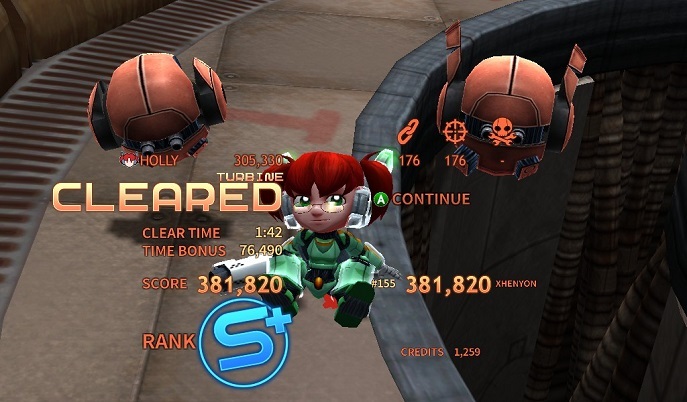 After each successful level, you obtain points which can be used to buy an EX OPTION found on the Collections menu. Some of these are simply bizarre, others can make the game look more attractive, others make it more challenging, others even change the way you play. It’s an interesting fun box that allows you to enable one or multiple of these options at a time, but you have to earn them! The game offers a campaign with 5 mayor areas, containing a total of 25 stages. Not to mention Infinity Drive (endless amount of of waves to test your endurance) and a Daily Drive stage for Leaderboard shenanigans. You can also play local co-op with up to 4 players, increasing enemy waves difficulty and fill your screen with bullets flying everywhere! Yup, this is First Person mode, unlockable from the EX Options. 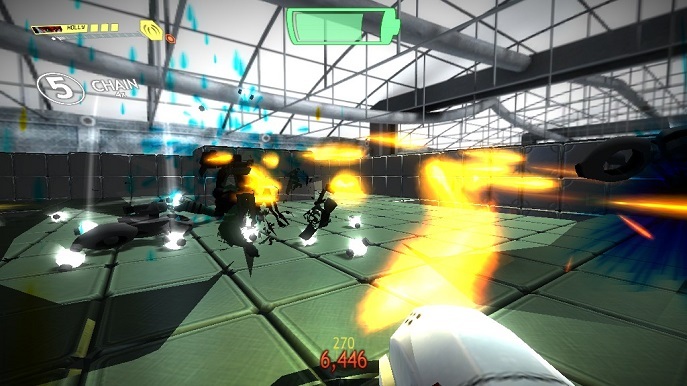 The game stands out with its variety in the color palette and 3D modeling. Each character is designed in a very unique way, in accordance to their personalities. You would think a game this visually demanding would affect the framerate, but it mostly does not (as some areas are weird for some reason); The amount of particles used and so many animations going on at a time really support the action theme of the game, it’s almost impossible to get visually bored. Music by the talented Jeff van Dyck. The sound proposal for this game simply does it right. Not only is it well balanced and mixed, but it scales accordingly to the tension and combo meter, a very well implemented automated soundtrack for a great genre. 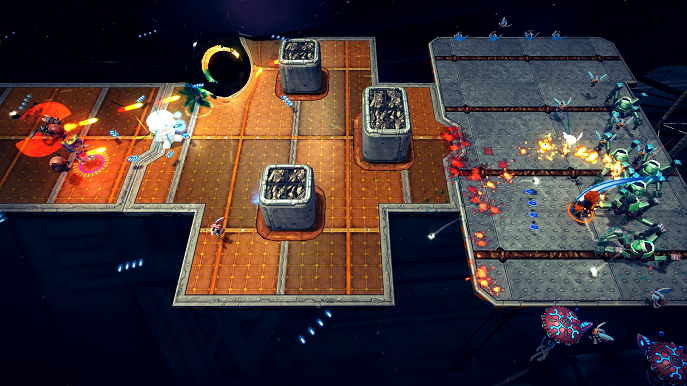 Every level is phenomenal to play, and the fun factor is constant as stages load really quickly in between each other. I also feel that the more you play the more you get rewarded which is always a nice touch. Another aspect I found interesting is how stages change between waves, setting new challenges that you must deal with at a short pace. Higher difficulties do get tiresome as they just get ridiculous. Sometimes reaching or just trying to get a battery can be dreadfully hard, and some enemies can down you really fast sometimes. However, it’s a challenging genre, whether balanced or not for some players, it’s a very interesting experience that keeps you on your toes and on the edge of danger.